Roberto Fonseca’s album “Yo” is one classy piece of work. The Cuban pianist - more famed in the UK for his work with the Buena Vista Social Club - here presents his own musical vision that explores the themes of love, identity and spirituality. There’s very much an African connection throughout, directly (through the African artists' own traditions) and indirectly (both Cuban music and Jazz are ultimately descended from Africa) and the afro-cuban religions Santería and Palo de Monte infuse the work too. In its simplest description it’s a marriage of African and afro-cuban music forms and jazz. Nothing new, you say? Well, the idea has been explored for many decades, true, but Fonseca brings many wonderful ideas and fresh influences to bear on this work. In particular the sheer class of the African musicians he is working with is worth pointing out. “It has always been a dream of mine to explore what my compositions could offer if interpreted by African musicians of my generation". People of the calibre of the Malians Baba Sissoko and Fatoumata Diawara, and Guinea's Seckou Kouyate, all feature on this album, as well as the Brazilian Munir Hossn on guitar, Cameroonian Etienne M’Bappé on bass and the Cuban percussionists Ramsés Rodriguez & Joel Hierrezuelo. Although this is an instrumentalist’s dream, the vocals are worthy of note too, supplied by the Algerian star Faudel, the American hip-hop MC and spoken-word artist Mike Ladd and the Senegalese singer Assane Mboup of Orchestra Baobab fame. All fifteen musicians are very impressive, really drawing out Fonseca’s vision - and there’s even a couple of tracks co-produced by Gilles Peterson. You can hear the Classical African sounds of the kora and ngoni, flowing side by side with European Classical traditions as well as more 20th and 21st century improvisational ideas. And, yes, elements of rock and hiphop are also thrown into the mix, but it’s the blending of all this that gives it a unity of purpose. This is definitely Fonseca’s voice, spoken through many instruments. Each of the twelve tracks here are like chapters in a book of short stories. Self-contained and distinct in character, but with the hand of Fonseca holding the pen. The album kicks off at high-energy and speed with a track called 80s - that punches its way through your speakers to make you sit up and listen. As Randy Jackson would say: “Yo! Dude!”. Love the jittery piano and runaway train feel of it, although bizarrely it all ends with the rollicking drums and guitars fading off down the track and we stay behind with Fonseca doodling meditatively away on his piano. The next track, Bibisa, picks up again with piano and introduces the vocals of Malian Fatoumata Diawara and one of my favourite pairings on the whole album: Baba Sissoko on ngoni and Seckou Kouyate on kora - two West African instruments of great antiquity and versatility, pitted against Fonseca’s fabulous piano technique (stuttering ostinatos and syncopations tipping into lyrical runs). There’s also an alternative remix version of this track on the album - two tonnes of swag and huevos de acero. On Mi Negra Ave Maria (one of the two co-productions by Gilles Peterson), Fonseca gives us a delicate and delightful prelude on his piano before the drums and bass tentatively join in alongside the spoken vocals of Mike Ladd reading the poem “The Daughter of Obatalá” over the repeated and increasingly dense patterns of sound being created. The whole piece thickens and thickens in texture and Ladd’s delivery becomes more and more intense. It’s almost like Talking Heads for a new generation. Very uplifting. 7 Rayos is probably my personal favourite, from the hypnotic ngoni intro to the mystical poetry of Nicolas Guillén. The strange combinations of instruments and sound effects, are fuel to the imagination. I’m hearing the clank of chains, the serried ranks of ancestors stretching back to the beginning of humanity, of gods inside the batá drums, the flow of blood, the tramp of feet and endless, endless vistas in time and space. And am I really sensing the Beatles filtered through West Africa underneath it all? Hmmm. Must be that Palo influence. Al fin de cuentas somos todos: yoruba, congo, mandinka o carabalí . . .
You know, there’s just so much great music in this album. What about the next one: El Soñador Está Cansado (the dreamer is tired). Fonseca on that lush piano of his again, underpinned by congas and some marvellous talking drum, just setting us up for ages until the band turns up alongside them like a long-distance runner’s pace-setting companions, and they all lock into a jazzy soul-funk groove that keeps on running. Well, if all us dreamers were tired before, then Chabani is the track to wake us up again! Taken at a breathless pace, it’s another one that grabs you by the arm and won’t let go. You've just got to hang on and trust in the power of funk. Altogether now: I believe! The dynamic tension is evident as Algerian singer Faudel lures us to North Africa with his voice whilst the frantic talking drum (tamani) of Sissoko pulls us ever southward. Gnawa Stop fuses North African Gnawa with an almost abstract jazz tone feel. In a way, it’s the vibe that’s really important about this piece. The instruments are layered beautifully: the sharp crackling North African drums, the fuzzy almost buzzing bass guitar, the relentless clapping that drives the tune forward like a camel disappearing over the horizon, the revving-up effect of the talking drum, the incessant chatter of the ngoni and the restless, unsettling piano washes and colours. You follow the tune as it seems to appear from nowhere, crosses in front of you and finally disappears into the heat-haze. You end up in a trance where the patterns swirl around in your head and would probably continue - in true gnawa fashion all through the night - if the next track didn’t give us a little pause to break the spell. El Mayor is an interlude based around an old jazz piano on a radio that is constantly being retuned. JMF starts as a lush but gentle piece before setting up a slow insistent majestic montuno groove that it proceeds to plough via some sensational electric kora and Hammond organ work with an old-school retro Cuban vibe that just hits. Así Es La Vida (That’s Life) is music to smoke a cigar to. Listen to it and you’ll know what I mean. Pensive and melancholy, but stately and assured at the same time. Serene piano trio jazz to blow smoke rings to. And speaking of stately music, Quien Soy Yo (‘Who am I?’ - another leitmotif of the album) follows a Cuban danzón format - a formal, courtly dance of elegance and restraint, before Munir’s Brazilian cavaquinho and Assane Mboup’s vocals appear from left-field and - partners in hand - take to the floor too. It’s an album that should appeal to a wide spectrum of audience once you sit down and listen. It’s oozing jazz, rock, funk, rumba, gnawa, montuno, hip-hop and a whole load more, all marinated in that ineffable Cuban sabor. The lasting impression is one of experimentation, exploration and conversation - but always, always movement. It’s a very hypnotic album. 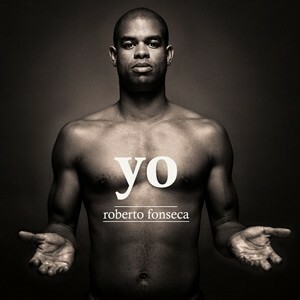 Roberto Fonseca’s “Yo” has already made it onto my Shortlist for Best World Music Albums of 2012. Love it! But you’ll have to wait until the beginning of 2013 to find out where it places finally. "Yo" is released on Jazz Village / Harmonia Mundi on Monday 19th March 2012.